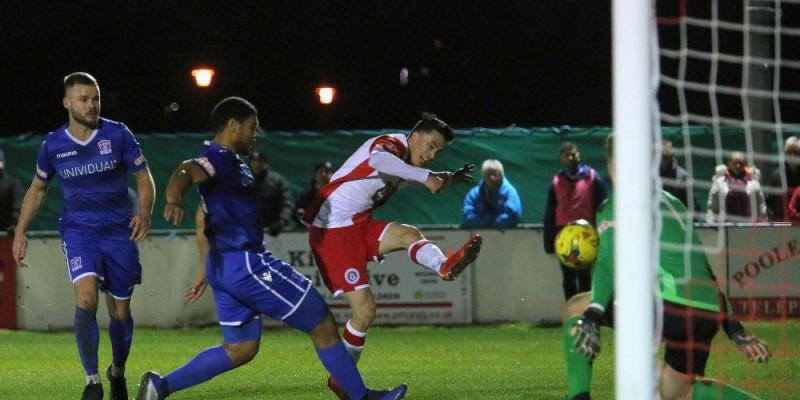 Swindon Supermarine face a rejuvenated Poole Town at The Webbs Wood Stadium this Saturday (kick-off 3pm) and they will be looking to avenge Marine’s impressive 5-2 win down in Dorset in January writes Nick Taylor. Marine produced arguably their best performance of the season when they defeated ‘The Dolphins’, thanks to a brace from leading scorer Conor McDonagh, plus goals from Ryan Campbell, Matt Liddiard and Stuart Fleetwood (pen), with pacey left winger Luke Roberts (pictured) notching a brace for Poole that evening. Since the heavy home defeat Tom Killick’s side have gone on to record an impressive five match unbeaten run and will arrive off the back of a comfortable 3-1 home win to Walton Casuals on Tuesday night and will, no doubt, be in high spirits hoping to continue their excellent away form which has now seen them elevated above Marine in the league standings to now sit one place outside the play-off places, in sixth position. Having had last weekend off due to their away fixture at table-toppers Taunton Town being ‘snowed off’, Marine boss Lee Spalding is now expecting his squad to be desperately keen to make amends for their disappointing last showing, the 4-0 home defeat to struggling Frome Town, when debutant keeper Martin Horsell was controversially shown a straight red card for denying a goal scoring opportunity by handling outside of his area on 40 minutes. Marine keeper Martin Horsell is unavailable to play as he serves out his one-match ban, with Will Henry returning on loan from Swindon Town to deputise between the sticks for Marine.